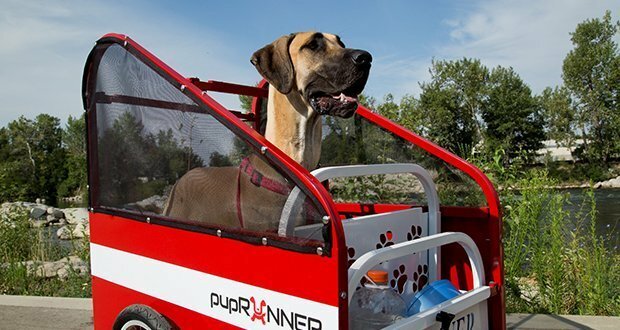 When your pooch gets dog tired (pun intended), you can give him or her a lift with a new bicycle trailer invented by Idaho couple Anna and Ben Carter. It all started four years ago when Anna and her husband Ben “were always having to choose between taking a bike ride down the Greenbelt and walking our dogs. We wanted to do both,” recalls Anna. Together, the couple searched everywhere for a safe and convenient dog trailer to attach to their bikes. They found that some let the dogs run behind the trailer, but didn’t appear very safe, while others only allowed the dog to “ride” along behind them, which they knew their energetic dogs would quickly tire of. After much frustration, Ben decided to take things into his own hands, and so the first pupRUNNERS® were born. Together, they started selling their new and innovative trailers in August of 2011; so far about 75 have been sold. “Our product is constructed 100% with aluminum. We don’t use a cardboard insert for the ‘floor’, and you can actually exercise your dog in the safety of the trailer enclosure. You don’t have to worry about the dog pulling you over on your bike, he won’t have the ability to run under your tire or the option to dart into people or pets on the trail,” points out Anna. pupRUNNERS® come in nine colors: Hydrant Red, Bike Blue, Jet Black, Bright White, Petal Pink, Ocean Blue, Tangerine Orange, Sunshine Yellow, and Urban Chrome. The accent stripe on the pupRUNNERS® matches the basket color, which is either white or black. Ben and Anna live just off the greenbelt by the Glenwood bridge. “We typically go straight from home out past Veterans Park and back on our greenbelt trips. We also love to ride by the area by the zoo,” shares Anna, describing her favorite greenbelt ride. Ben and Anna have been married five years after they met on the social network Myspace. “Ben was living in Montana; I imported him!” Anna confesses. You might catch the couple on one of their bike rides with their two dogs, Paco, a three year old Airedoodle, and Jax, a miniature schnauzer who just turned one. pupRUNNERS® range in price from $399-599, depending on size and options chosen. Optional accessories include a sun top, a back panel for when the dog is riding, a bike mirror, an extra bike hitch, and extra wheels. The pupRUNNERS® have been showcased at local events, which Anna says has really helped with exposure. What originally started as a small garage project for Ben and Anna has grown considerably in recent months. In order to scale up their production of the pupRUNNERS®, Anna and Ben launched a Kickstarter in September in order to raise the funding they need. To find out more about the pupRUNNERS® and to inquire about buying one, visit www.puprunners.com, or search for their Kickstarter campaign at www.kickstarter.com.